We offer a breadth of dental experience. Since the inception of Pine Dental Care with Dr. Czerepak in 1986, we have been serving patients of the Lincoln Park and surrounding communities for years. Dr. Hijjawi has been in our north suburban office (previously in Winnetka, moved to Glenview in 2007) for twenty years. We have six doctors at our practice, each highly educated and qualified in their respective specialties. Our involvement in the dental community is extremely strong as the pediatric dentists are on staff at the Ann and Robert H. Lurie Children's Hospital of Chicago and all of the doctors are involved in their local, state, and national dental organizations. All of the pediatric dentists in our group are board certified by the American Board of Pediatric Dentistry, a voluntary peer reviewed examination. Please refer to our doctor bios for more information. We care. Period. The dentists and staff at Pine Dental are committed to a unique patient experience. Our patient families have often been with Pine for years and continue to return due to the caring, comforting, and relaxed environment that has existed for years. Our individualized approach to pediatric dental and orthodontic care is focused on your child, and we are committed to making your child feel respected and understood during his/her visit. As a parent, you will see and spend quality time with the doctor at each visit, where you will discuss your child's existing dental conditions, their progress, and have the opportunity to ask any questions that you may have. We do our research and use the most modern, safe, and efficient approaches to pediatric and orthodontic care. Whether that means low friction, low force braces with the orthodontist or the use of the latest bonding materials with one of the pediatric dentists, we are determined to provide our patients with the best technologies available that stand up to the tests of time and thorough scientific study. We have a fun office full of smiles. Our patients are often found laughing in the chair with one of the doctors or staff members, contently watching videos or television in the chair during long appointments, or playing with the numerous toys and video games in the office waiting room. 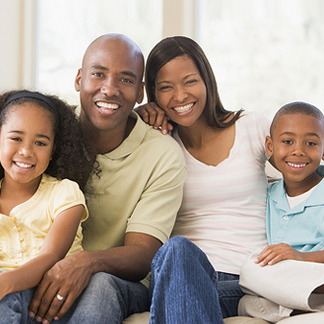 Our goal is to provide a relaxed, safe, and caring environment for patients and their families. Our practice offers you the benefits of pediatric dentistry and orthodontics in one office. Pediatric dentistry focuses on the guidance and development of the primary and permanent dentitions, and your pediatric dentist therefore can recognize when interception may be needed to aid in the development of the teeth and jaws. Orthodontists specialize in the treatment of developing facial, jaw and tooth abnormalities. Thanks to their proximity, our orthodontist Dr. Therese and the pediatric dentists have a built-in system for referral, consultation, and multiple expert opinions on every case. This offers ease of communication between doctors, patients, and their families. We use the highest standard of digital radiography in all of our pediatric and dental X-rays. Our system offers images of much higher quality, while greatly reducing radiation exposure to a fraction of conventional radiography. The system is then completely integrated with our patient charting, which allows us to use machines which produce less radiation than other systems, and our high-tech sensors are more comfortable than traditional paper films. In short, taking X-rays for your child will be as easy and low in radiation as possible. Pine Dental Care is environmentally friendly. Our office is completely computerized and paperless, allowing patient chart access anywhere throughout the office by any of our doctors. This allows for a seamless integration of X-ray technology and patient chart information with office scheduling, and far less paper consumption in the process. It also offers improved communication between all of the doctors at Pine and with our referring physicians and dentists. Also, thanks to our digital X-rays, we are able to avoid the use of messy, environmentally unsound chemicals used in the processing of traditional X-rays.